Great news for bicyclists using eastbound Kirkwood Highway. 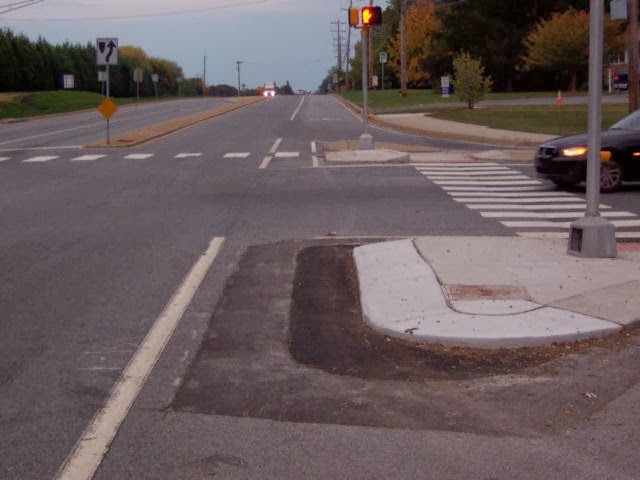 An over-sized channelizing island (aka "Pork Chop") near the intersection of Harmony Road, built as the result of a new Super WaWa, will no longer block the bike lane. The photos below demonstrate how a bicyclist must take avoiding action - into the lane of high speed traffic. The bike lane was the result of new construction, and is required as part of New Castle County's building code should the entrance include a right turn-only lane. 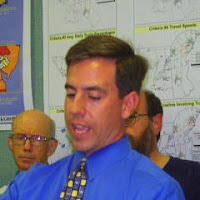 Mark Luszcz, DelDOT's Chief Traffic Engineer, followed up immediately upon our request. Thankfully, his colleagues agreed that this pork chop is over-sized and out of compliance, and crews will apply the knife come Springtime as part of a nearby pave & rehab project. II Policy, Paragraph 3: “The continuity of existing paved shoulders shall be maintained at the widest possible width. The desirable width of 5-ft (1.5m ) travel way on the shoulder shall be maintained for bicycle use unless exceptional circumstances occur that require emergency operational safety improvements that compromise this width. If the width of a paved shoulder area must be compromised to less than four feet, the area shall be appropriately marked as a hazard for bicyclists and the Department shall concurrently nominate a project that will result in the restoration of appropriate accommodations for bicycle travel”. There is also a design guidance memorandum, won by advocates in 2010, that specifies at least 4' of shoulder offset, which should eliminate this problem during the design phase. 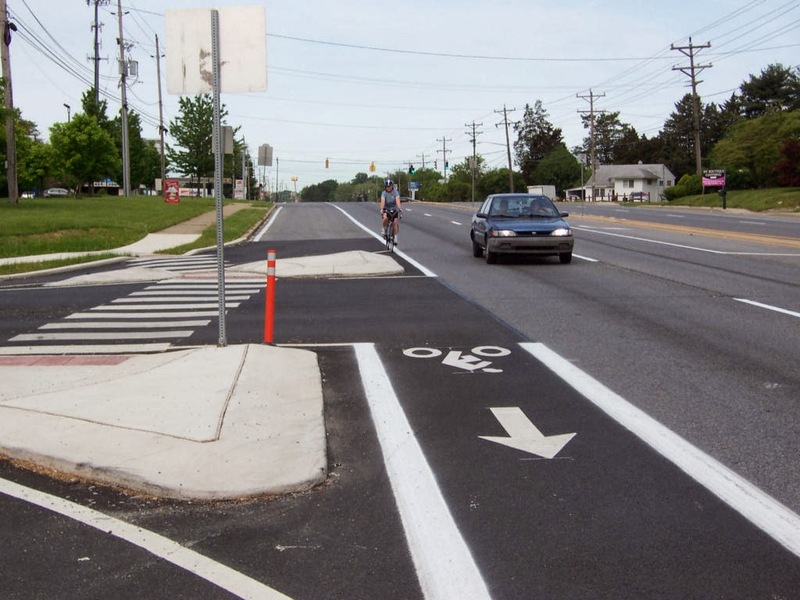 Above: A pork chop at Walther Road and Old Baltimore Pike was trimmed a few years ago at the request of area bicyclists. It shows what can be achieved when we take notice. 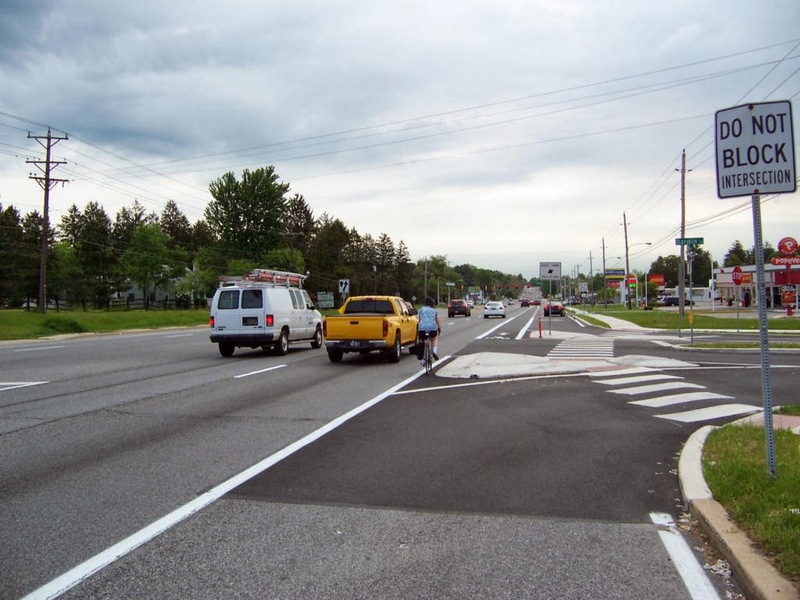 For an illustration of this error in 2009, and how it was corrected by DelDOT shortly after, click HERE. Do you know of a pork chop built after 2010, that impedes bicycle safety in the shoulder or bike lane? Let us know about it with a comment below.